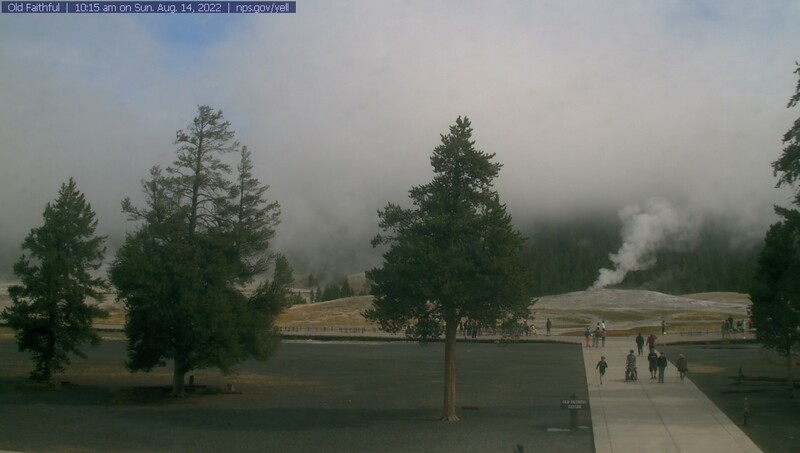 This view of the Old Faithful Geyser is captured from a webcam inside the visitor education center. Predictions for the next Old Faithful Geyser eruption are shown on this page. If you want to catch a live, uninterrupted view of the geyser in action, check here first for the next prediction before going to the Old Faithful Geyser Live! Webcam page. If you entered Yellowstone through the historic Roosevelt Arch, this view from the north entrance station may look familiar to you. Morning views on this webcam are spectacular, and we anticipate the scene during the winter months to be amazing when the morning sun touches Electric Peak. Look for wildlife -- elk, bison, and pronghorn can be seen grazing in the foreground. Occasionally you may see the top of oversize vehicles like RVs, tour buses, and delivery trucks as they stop at the entrance station. With a quick refresh rate of 30 seconds, those shots should be few. Yellowstone is a place of change, and this view highlights a place where change is constant and evident, the travertine terraces. The terraces are formed when water rises through limestone carrying high amounts of dissolved calcium carbonate. At the surface, carbon dioxide is released and the calcium carbonate is deposited, forming travertine, the chalky white rock of the terraces. Due to the rapid rate of deposition, these features are always changing. When the Army was based in Fort Yellowstone, this is where the officers and their families were housed. It was a good duty station. Because of its good facilities, relaxed discipline, and interesting surroundings, Fort Yellowstone was considered a prized assignment by many officers and enlisted men. But protection of the park did not suffer. Soldiers were ordered to "conduct themselves in a courteous and polite, but firm and decided manner" when carrying out their duties. Today, these buildings make up the Albright Visitor Center, offices for park operations and living quarters for employees. Mount Washburn is one of three fire lookouts and the only one that has been staffed in recent years. This webcam captures a birds-eye view of the park and in the summer can be directed by the fire lookout who dedicates their time waiting, watching, and wondering if that storm in the distance will ignite a fire. At the top of Dunraven pass at an elevation of 10,243 feet is Mount Washburn. The views are spectacular. It is a six-mile hike round trip to the top of Mount Washburn and back. A fire lookout is stationed at the top of Washburn and uses this camera to track fires during the summer season. When it is not being used to track fires the webcam is usually pointed in a southern direction with a view of the ridgeline of Mount Washburn in the foreground, and the Grand Tetons, portions of the Grand Canyon of the Yellowstone and Yellowstone Lake in the upper left hand corner and background. The camera looks west toward Biscuit Basin, at the north end of the Upper Geyser Basin. In the image, the Firehole River flows north (to the right). Behind it, a boardwalk passes Wall Pool, Sapphire Pool and other thermal features. In the background, the tree-covered ridge is composed of the ~114,000-year-old West Y ellowstone rhyolite flow. This area hosted a variety of rock- hurling hydrothermal (steam) eruptions during the 1930s and in the wake of the 1959 Hebgen Lake earthquake. In recent years, similar smaller blasts have been known to occur.